Chronic kidney disease is defined as having some type of kidney abnormality, or "marker", such as protein in the urine and having decreased kidney function for three months or longer. There are many causes of chronic kidney disease. 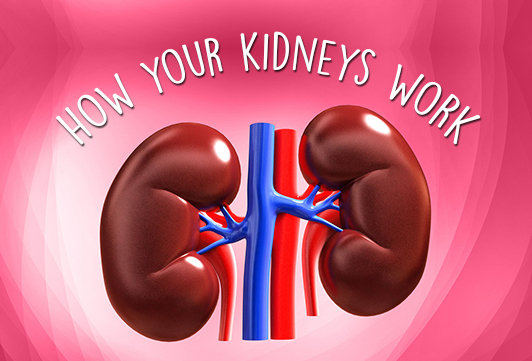 The kidneys may be affected by diseases such as diabetes and high blood pressure. Some kidney conditions are inherited (run in families). Others are congenital; that is, individuals may be born with an abnormality that can affect their kidneys. The following are some of the most common types and causes of kidney damage. Diabetes is the leading cause of kidney disease. High blood pressure (also known as hypertension) is another common cause of kidney disease and other complications such as heart attacks and strokes. Glomerulonephritis is a disease that causes inflammation of the kidney's tiny filtering units called the glomeruli. Polycystic kidney disease is the most common inherited kidney disease. It is characterized by the formation of kidney cysts that enlarge over time and may cause serious kidney damage. Kidney stones are very common, and when they pass, they may cause severe pain in your back and side. Urinary tract infections occur when germs enter the urinary tract and cause symptoms such as pain and/or burning, but they sometimes spread to the kidneys, and they may cause fever and pain in your back. Drugs and toxins can also cause kidney problems. 1.A test for protein in the urine. Albumin to Creatinine Ratio (ACR), estimates the amount of a albumin that is in your urine. An excess amount of protein in your urine may mean your kidney's filtering units have been damaged by disease. One positive result could be due to fever or heavy exercise, so your doctor will want to confirm your test over several weeks. have a family member who has chronic kidney disease.